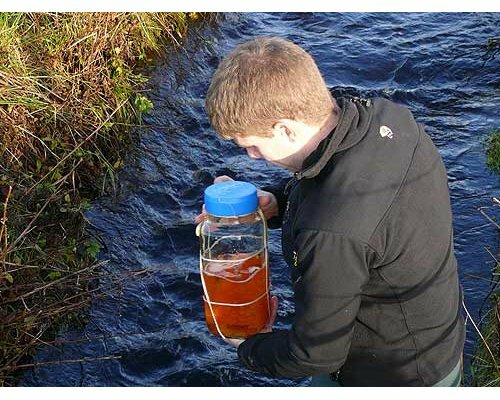 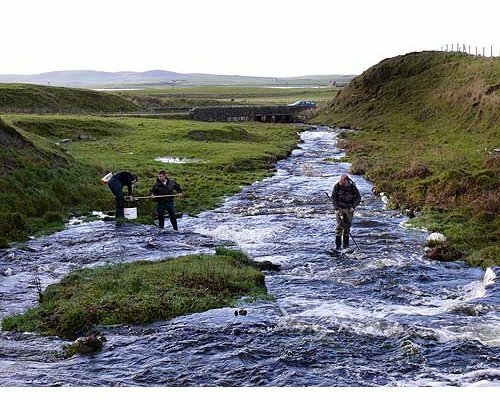 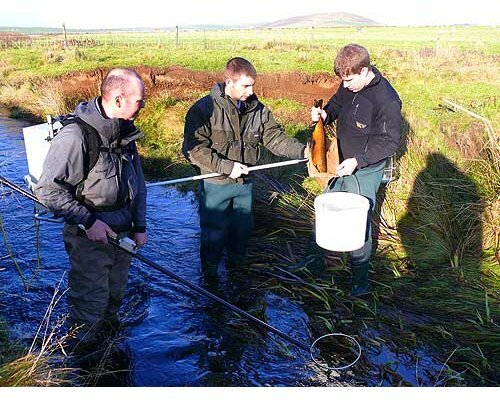 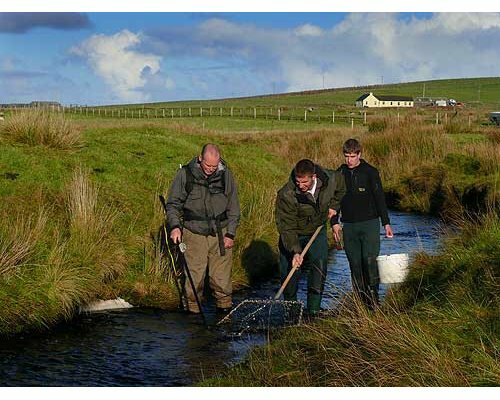 Following the heavy rains of late November I decided to accompany a hatchery spawning team on a trip to the Swanny and Netherbrough (Harray Loch) burns to collect eggs for the Trout Fishing Association hatchery. 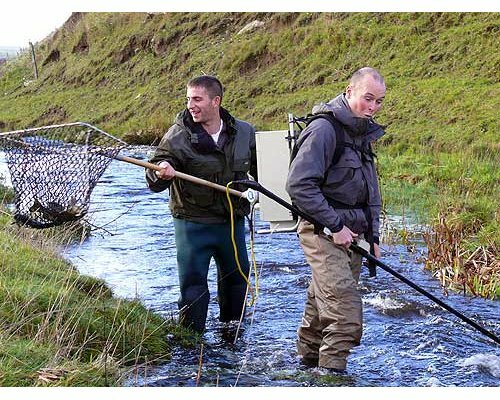 To ensure good light for photography we decided to abandon the traditional egg collection method of nets by torchlight in favour of electrofishing. 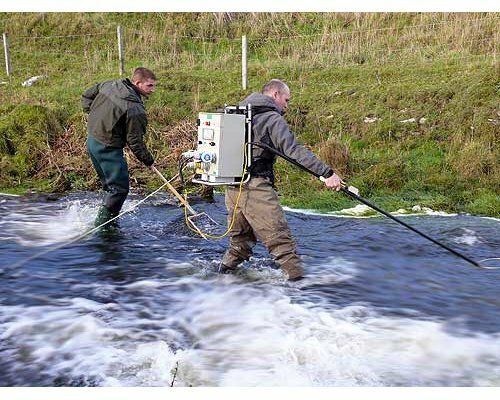 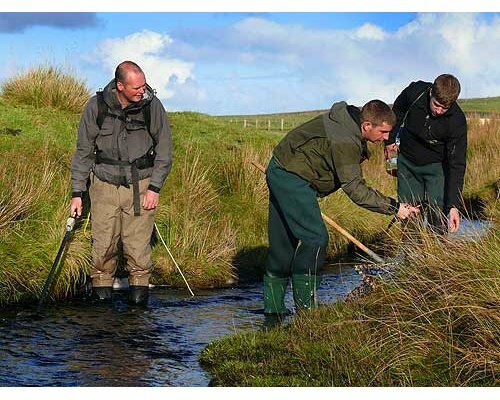 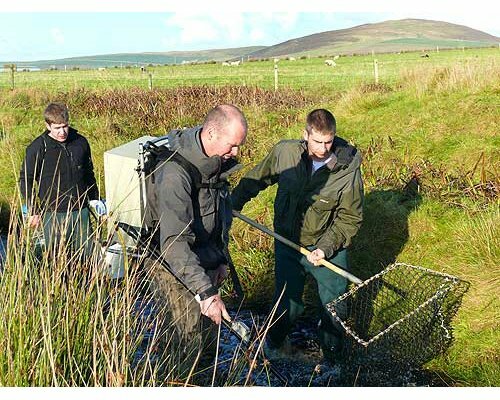 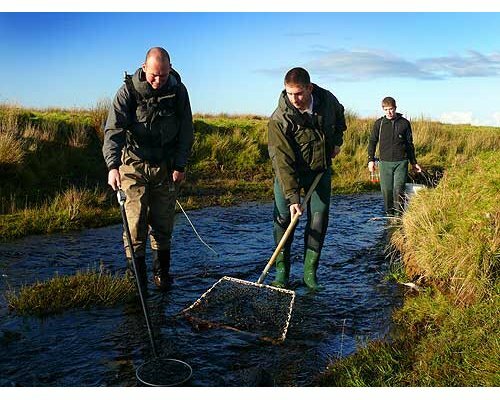 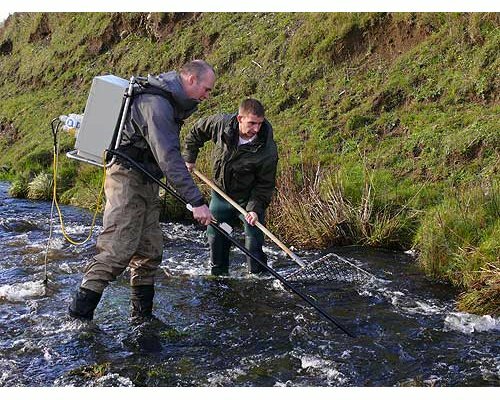 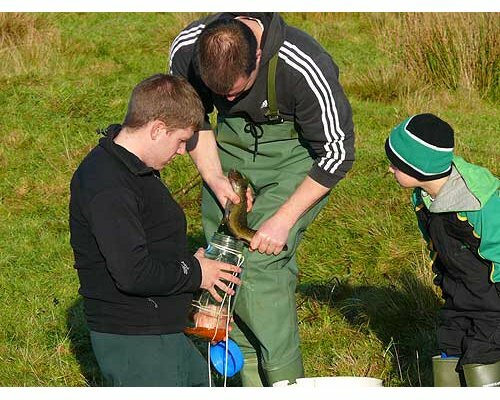 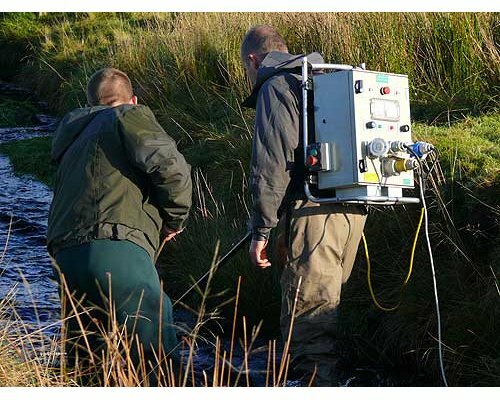 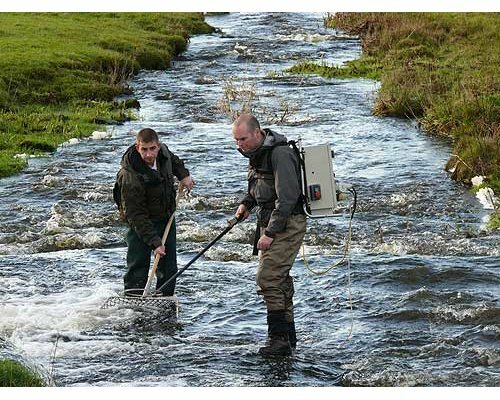 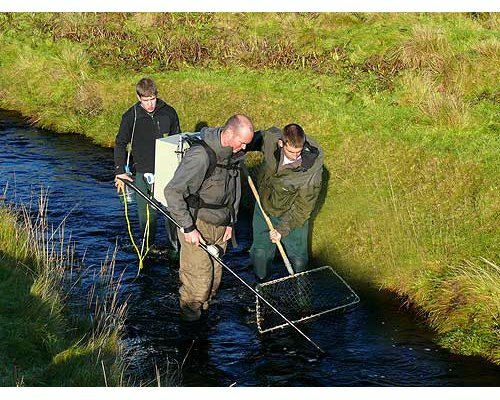 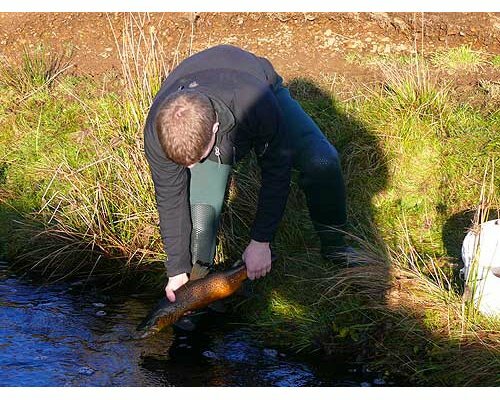 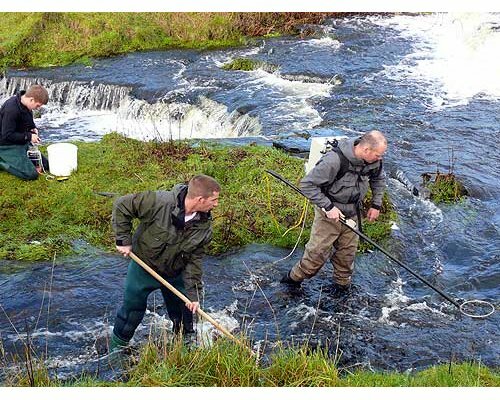 The electrofishing equipment makes collecting eggs simpler and can be carried out during daylight hours. 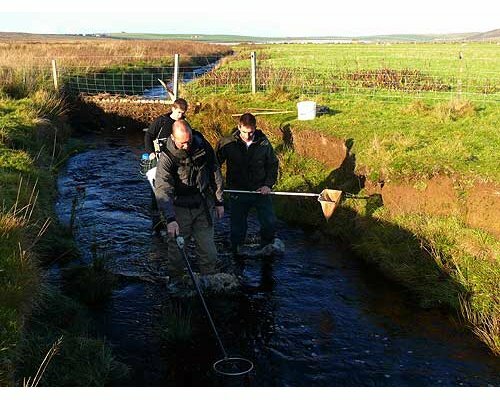 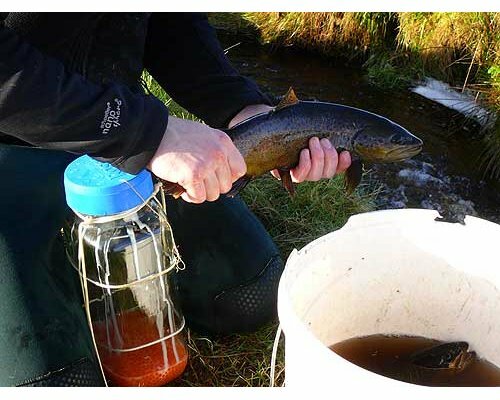 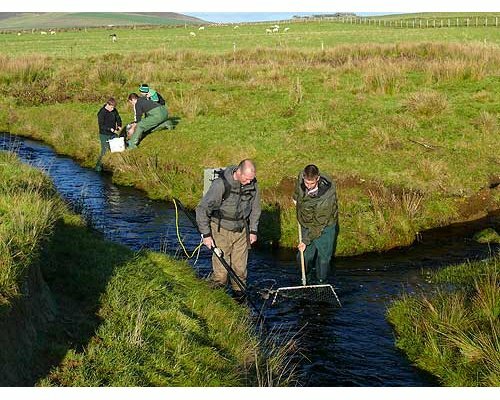 Basically elecrtofishing uses electricity to stun fish before they are caught, it is more commonly used here in Orkney for scientific survey purposes but in the skilful hands of our trained members it can be very productive in egg collection. 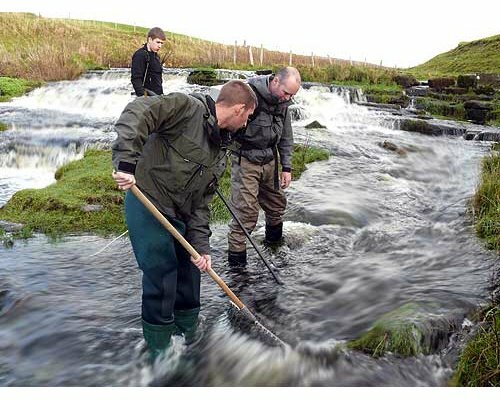 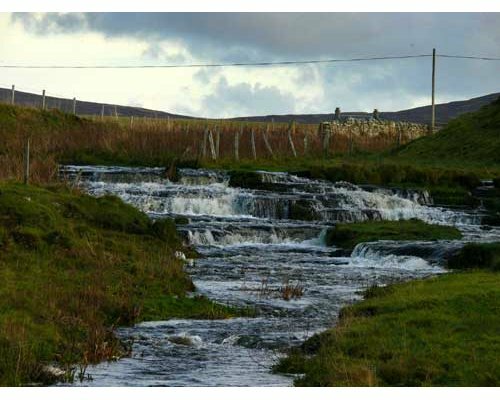 Late November is traditionally when the Orkney Trout leave the locks and head up the burns to spawn. 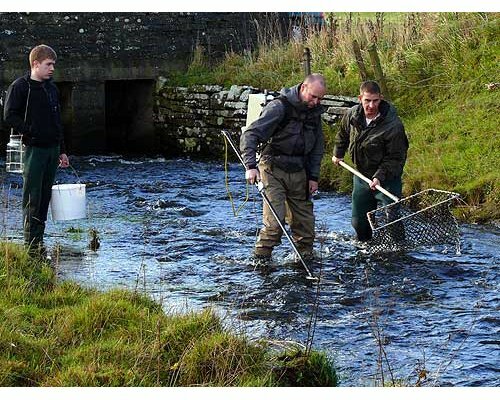 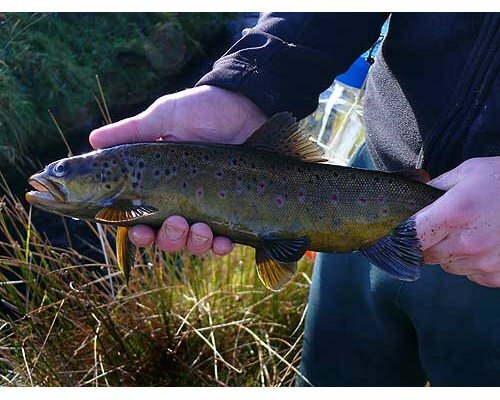 Since the very first OTFA hatchery was built in 1929 the Association has continued to aid the natural cycle of the trout by stripping eggs and hatching them for later stocking. 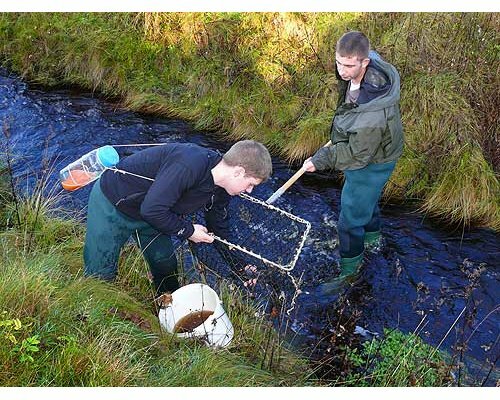 This practice is a safety net for the eggs and ensures health fry in the early spring if nature harms the eggs by means of heavy rain storms or pollution. 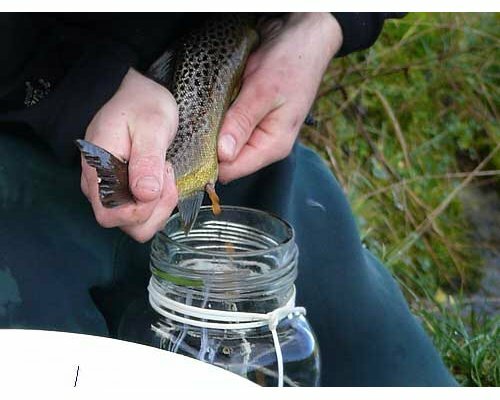 Once the eggs from the hen fish have been collected a ripe male is found and his milt is mixed with the eggs in the collecting jar it is all washed using the burn water, this ensures fertilisation. 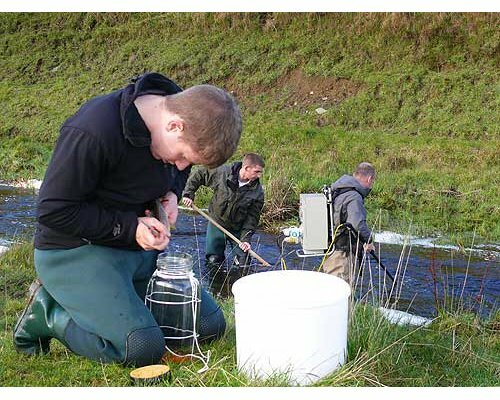 The eggs are then transferred to the Hatchery at Kirbister Loch where a team of dedicated hatchery volunteers attend the eggs. 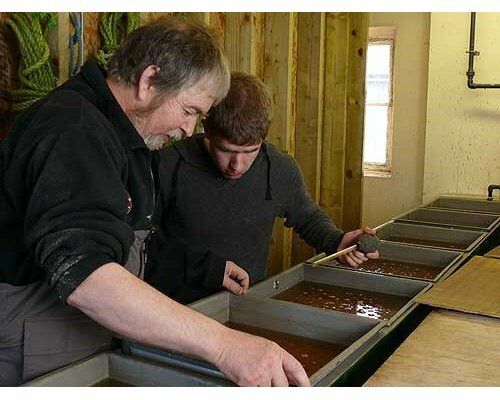 The ova are placed inside plastic trays. 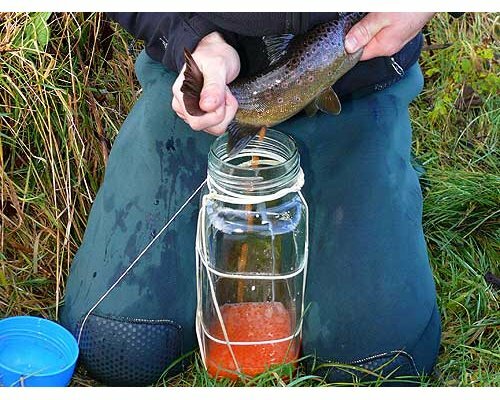 A supply of clean filtered water is passed constantly over the eggs. 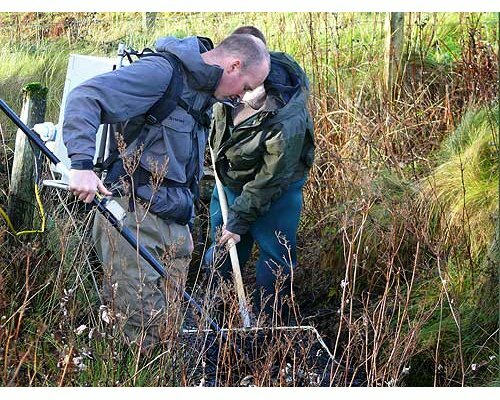 It is important to remove dead eggs, as they attract disease. 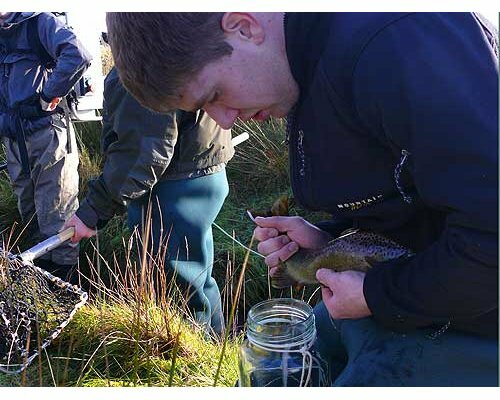 Dead eggs are white in colour and can be removed with the help of pipettes. 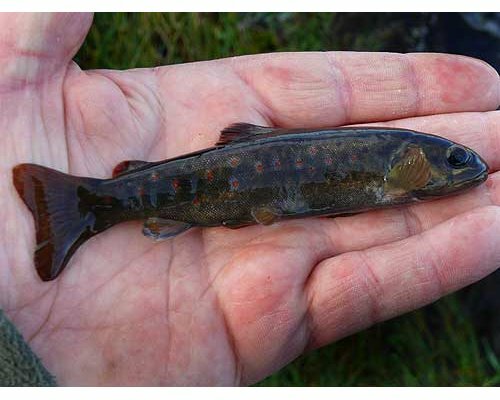 After a few weeks the ova hatch to fry and are then available for stocking.